On February 16, 1999 QB Jeff Garcia was signed to a two-year contract by the San Francisco 49ers. Garcia, just short of his 29th birthday, had spent five years with Calgary of the CFL and had quarterbacked the team to a Grey Cup title in 1998. Successful in college at San Jose State, the slightly-built (6’1”, 195) Garcia went undrafted by NFL teams in 1994 that were concerned about his lack of arm strength and awkward delivery, and signed with the Stampeders. He backed up Doug Flutie for two years, seeing scant action as a rookie but far more, and with good results, when the veteran quarterback was injured during 1995. After Flutie departed for Toronto in ’96, Garcia took over the starting job. The team won three division titles and a championship and Garcia received all-division honors three times and was the Western Player of the Year in 1997. He passed for 4276 yards and 28 touchdowns in ’98, giving him a total of 16,449 yards and 111 touchdowns, against 52 interceptions, overall in the CFL. Highly mobile, if not a particularly fast runner, he also rushed for 2358 yards and 24 TDs. Garcia had caught the eye of ex-49ers head coach Bill Walsh in college, and with Walsh returning to the team as general manager, the way was paved for the CFL star to come to the NFL. San Francisco had enjoyed a great deal of success over the past two decades and had not had a season with less than ten wins since the strike-shortened 1982 campaign. That included a 12-4 tally under Steve Mariucci in 1998 with Steve Young at quarterback. 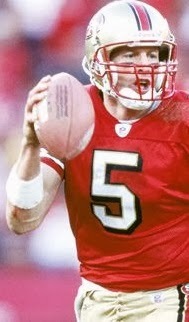 The successor to Joe Montana, the legendary quarterback of four Super Bowl-winning squads, Young had continued the record of excellence at the position for the 49ers, topping the NFL in passing a league record-tying six times, garnering selection to seven consecutive Pro Bowls, twice receiving MVP honors, and adding a Super Bowl victory following the 1994 season. However, Young turned 37 during the ’98 season and took a physical beating that included a career-high 48 sacks. He had not appeared in all 16 games in any of the past four years and it was hoped that Garcia would be able to compete with backups Ty Detmer and Jim Druckenmiller for a spot on the roster (both were gone before the ’99 season commenced). Moreover, the 49ers as a whole were showing signs of impending decline. There was instability at the ownership level and the team was in salary cap trouble. The result was a drop to 4-12 in 1999 and Young was finished after three games (it would prove to be permanent) due to a severe concussion. Garcia started ten of the remaining contests, with ex-Bear Steve Stenstrom behind center for three, and played his best in the last few, hitting on eight of his 11 touchdown passes and giving up just three of 11 interceptions in December games. He benefited from the presence of excellent wide receivers in Jerry Rice, the aging but still effective all-time great, and Terrell Owens, a rising star in his fourth season, and the running game was solid with another newcomer, RB Charlie Garner, gaining 1229 rushing yards. Questions regarding Garcia remained as the 49ers sought to rebuild, and they drafted two quarterbacks for 2000, Giovanni Carmazzi in the third round out of Hofstra and Louisiana Tech’s Tim Rattay in the seventh round. But Garcia allayed any concerns by having an outstanding year. He showed his commitment to conditioning by topping the whole team in an endurance competition during minicamp and also displayed a firm grasp of the West Coast offense that Montana and Young had excelled in. The team improved to 6-10 as Garcia passed for 4278 yards and 31 TDs, giving up only 10 interceptions, and rushed for 414 yards. He was named to the Pro Bowl. Garcia had another Pro Bowl year in 2001, throwing for 3538 yards and 32 touchdowns, and San Francisco returned to the playoffs as a Wild Card with a 12-4 record. While Rice was gone, Owens was a consensus first-team All-NFL selection with 93 catches for 1412 yards and 16 TDs, although he was also disruptive and in conflict with Coach Mariucci. Garcia, fearless with regard to running out of the pocket, also suffered knee and rib injuries. The 49ers topped the NFC West, albeit with a lesser 10-6 record, in 2002 and also won a playoff game for the first time with Garcia at quarterback, defeating the Giants in a come-from-behind Wild Card thriller, before losing to Tampa Bay in the Divisional round. Garcia was still a Pro Bowl selection, but with lesser numbers in a more conservative offense. Coach Mariucci was let go following the playoff defeat and replaced by Dennis Erickson for 2003. Garcia, after not missing a start in the previous three seasons, was out for three games due to an ankle injury. Moreover, even when playing, he was showing signs of physical decline at age 33 and his performance suffered. His completion percentage (57.4) dropped below sixty for the first time, his 80.1 passer rating was his lowest since he first took over the starting job in 1999, and his 13 interceptions were his highest total with the 49ers. The team’s record dropped to 7-9 and Garcia’s standing was not helped, at least with the fans, when Tim Rattay won two of three starts in his absence. Owens also was a strong critic, further poisoning the atmosphere. The result was that, as part of a general housecleaning of veterans from the roster, Garcia departed the team and joined the Cleveland Browns in 2004 (Owens was also dealt, moving on to the Eagles by way of Baltimore). In five years with the 49ers, Garcia more than justified his being signed away from the CFL as he started 71 games, completed 61.4 percent of his passes for 16,408 yards and 113 touchdowns while giving up 56 interceptions. He also ran for 1571 yards on 318 carries for a healthy 4.9-yard average and 21 TDs. The team reached the playoffs twice with him behind center and he was chosen to three Pro Bowls and, despite the aspersions cast by Owens, generally received good reviews for his leadership qualities. The losing season in 2003 marked the beginning of a long period of decline for the 49ers. They were 2-14 with Rattay and Ken Dorsey behind center in ’04 and did not return to the postseason until 2011. Nine different players started at quarterback during that time period. Jeff Garcia lasted a year apiece in Cleveland, Detroit, and Philadelphia, with the last stop featuring a strong performance in guiding the Eagles to the postseason in 2006 after starting QB Donovan McNabb went down with an injury in the tenth game. Moving on to the Buccaneers in ’07, he enjoyed one last Pro Bowl season as Tampa Bay reached the playoffs. He saw significant action in competition with Brian Griese in 2008, which was the last year that he threw a pass in the NFL. He was picked up again by the Eagles in 2009 and Houston in 2011 as injury insurance and was active for one game during that period, and in between was with the Omaha Nighthawks of the United Football League.